When thinking about Ireland, first things that spring to mind are beautiful tales, redheads, extremely green nature and good beer. But as long as here we talk about fashion, peculiar designs and fairytale like redheads are what we want to think about. 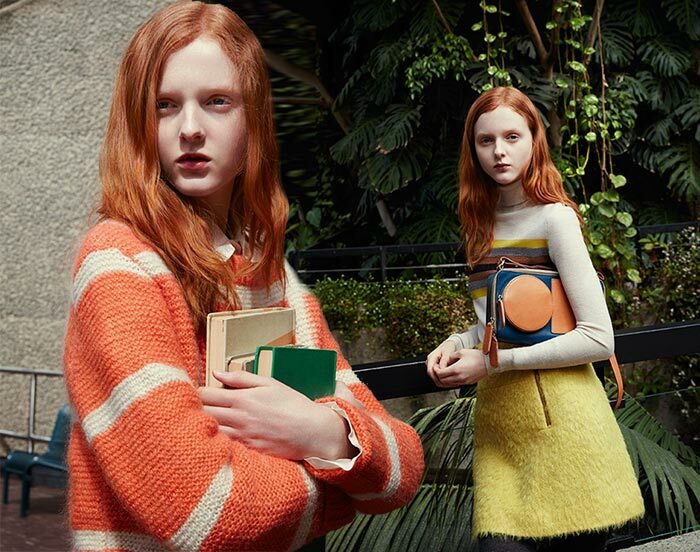 Here is a fresh and “newly baked’ topic for us to discuss, a story dedicated to those amazing “Irish’ things: Irish designer Orla Kiely, based in London, has prepared an exciting advertising campaign featuring redhead Madison Stubbington. She is an Australian model with typical British-Irish looks: her red hair, light blue eyes, fair skin and positive feedback have paved her way towards the heights of the fashion industry up to becoming the new face of Yves Saint Laurent. Now she appears in this pretty Orla Kiely fall 2015 ad campaign injecting sparkly warmth into the overall dreamy scene created. Photographed by the Ukrainian-born professional fashion photographer and painter Yelena Yemchuk, Madison poses for the pictures on the backdrop of high-rise buildings and lush green surroundings. The Orla Kiely fall 2015 collection is anything but bold, as all designs are quite preserved with almost no inch of skin showing. There are beautiful graphic numbers like the short peachy pink tube skirt topped with pink knitted sweater and an orange vest, the two-color deep green and pink A-line skirt topped with a grey knitted sweater with a light green neckline worn with a white club-collar shirt underneath. The idea here is to play with colors and create a stylish look without any obvious accent on the silhouette or skin, instead emphasizing the whimsical character and innocence of the look. See how curious is the oversize orange knitted sweater with thin white horizontal stripes on it: anyone would dream to have it for the days when you do not have any wish of overthinking the outfit and choose some skinny black pants and a top like this to radiate an effortlessly chic style. Green is a favorite color of the designer, for sure: so many touches, hues and hints are used in the collection to obviously or vaguely show it up. We are in love with the salad-green fluffy oversize coat and the A-line skirt of the same fabric. They are so good for adding some color to the gloomy days of fall and winter while providing the necessary warmth to your skin. And just next to these desirable comfy pieces there come stylish long-sleeve, puritan-collar and bib-neck bell dresses printed in pretty white checkered and green geometrical patterns. Saying stylish we cannot but mention the mahogany two-stripe buttoned trench coat, which will certainly look as fashionable as ever even in like 10 years. 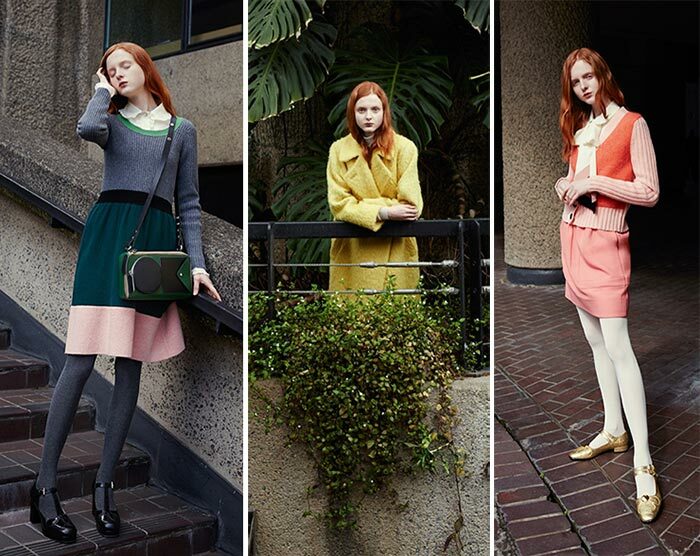 What makes the Orla Kiely fall 2015 campaign so special is that contrast is present in everything: the womanly garments and more personality-filled fun pieces go hand in hand like the golden shoes and wristlets with geometrical pockets on them. We might not be able to call it the most exciting and chicest thing, but it does have the distinct character in it that will make it differ from everything else. Isn’t it the main goal of any fashion thing?